You don’t have to be a lawyer to have heard the phrase “pain and suffering“—nor do you have to attend law school to understand what it means. But the truth is “pain and suffering” can mean several different things, and can even vary depending on the circumstances of a case. Knowing what pain and suffering actually means as it relates to your case should be one of the first steps in understanding your case and your options. 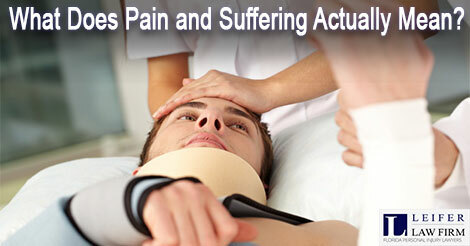 This is also where a personal injury lawyer can help. Injuries – particularly those caused due to an accident involving another person’s negligence – typically fall into two types: economic damages and noneconomic damages. Once you are familiar with these categories of damages, it is easier to understand how and when personal injury damages are awarded. If you see a doctor for injuries you sustained during an accident, you receive a bill for the cost of the visit. Similarly, if your injury forces you to take time off work, it is generally a straightforward task to calculate how much money you have lost due to missing work. These types of damages are not something you can see on an invoice or a billing statement. Furthermore, they often come with a significant personal cost that far exceeds the concrete costs associated with economic damages. For example, a professional pianist who sustains an amputation injury will likely never play the piano again, resulting in severe and permanent emotional pain and mental stress. Click here to read more on the Florida laws surrounding damages in a personal injury suit. If you have been injured in a car accident, it is crucial to speak with a Boca Raton personal injury lawyer as quickly as possible. The injured person’s life expectancy – If your injury occurs at a younger age, then you may experience pain and suffering far longer than someone injured as an elderly person. For example, the costs associated with quadriplegia or loss of a limb over decades of life can be catastrophic. Pre-existing conditions – If you suffer from a pre-existing condition, then the defendant will likely try to establish that your pain and suffering is not caused by injuries incurred during the accident, but is instead related to aggravation of a physical condition that existed prior to the accident. Occupation – An injury can change a victim’s life in numerous ways. When an injury prevents an individual from working in his or her chosen field or profession, the consequences can take an emotional, physical, and financial toll on the injury victim and his or her family. Visit this website here to learn more about how pain and suffering works in Florida. Do You Have Pain and Suffering Damages? If you have been injured in an accident, and you believe you are experiencing pain and suffering, you probably have a lot of questions about your case. Your next course of action should be to talk to a personal injury lawyer in Boca Raton. A personal injury lawyer can help you to explore your options in greater detail and decide on the next steps to take to pursue your case. Your attorney will also be able to tell you if you are entitled to compensation in your unique case, and what you can possibly do to recoup some of your losses and begin to move forward from your injuries. Read more about how a personal injury lawyer can help you put your life back together.